The Honda Civic Type R Could Cost $33,900 In The U.S. 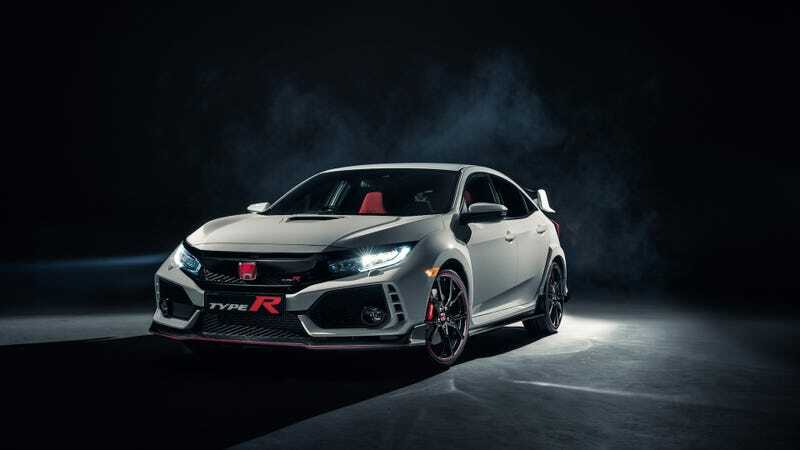 It may be hard to actually get your hands on the fury of a Honda Civic Type R in America, but if you do, it could come at a decent price: Our friends at the CivicX forums passed along a photo of what looks to be a Type R window sticker, which says the car will be conveniently priced at $33,900 in the U.S. The photo came from a forum user in Surprise (that’s a real city), Arizona, and the user said a person was putting window stickers on the cars before loading them onto the trucks when he caught a photo of the window sticker with the price tag on it. There are also a few photos of a giant, Type R-filled lot, if you want to check out the thread. The $33,900 doesn’t include destination and handling fees for the car, which were listed as an extra $875 on the sticker in the photo. That puts the total vehicle price of this particular Civic at $34,775, which, for the first new Type R to ever come to the U.S., really doesn’t sound that bad. At this rumored price, it’s about $10,000 more than the Honda Civic Si—the sport trim below the Type R that goes for about $24,000. Plus, the Type R has Nürburgring bragging rights and a rumored limited stock in America. The official pricing on the Type R hasn’t been released yet, but Jalopnik has reached out to Honda to see if the photo posted on the CivcX forums is legit. We’ll update as soon as we hear back.